Goats on the Road Posts » Our Story » Visiting Canada: Our Whirlwind Trip Home, and a Giveaway! After 5 wonderful months in Grenada we headed home to Canada for a quick 10 day visit. We needed to get some government documents in order and wanted to see our families as it had been two years since we had seen our younger siblings. We’re in Barbados now (woo hoo!) and we thought we’d fill you in on how our trip up north went. 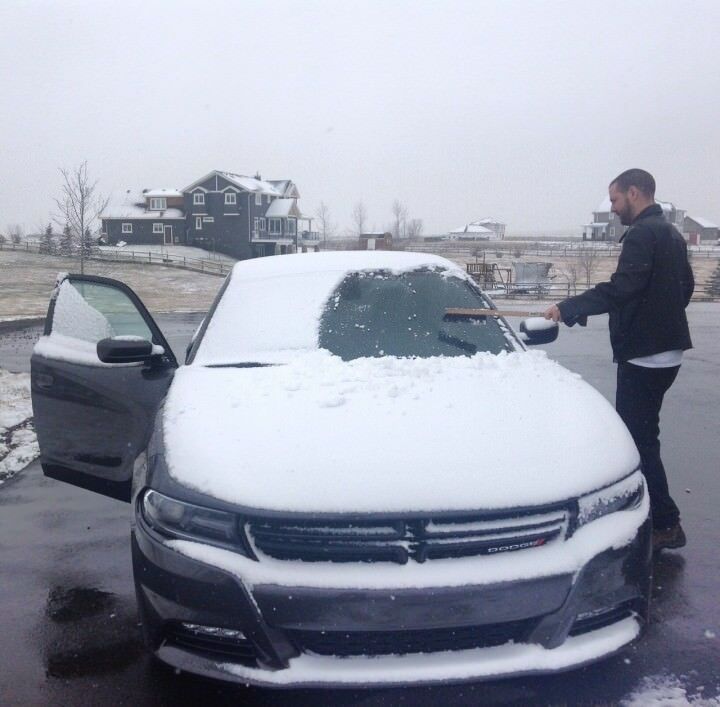 Usually when we visit Canada, I just drive my brother’s extra car, but as he’s trying to sell it, we decided to rent a car through EconomyBookings.com. When we arrived at the airport, we headed to the Alamo office to pick up our ride and to our surprise, we were upgraded! 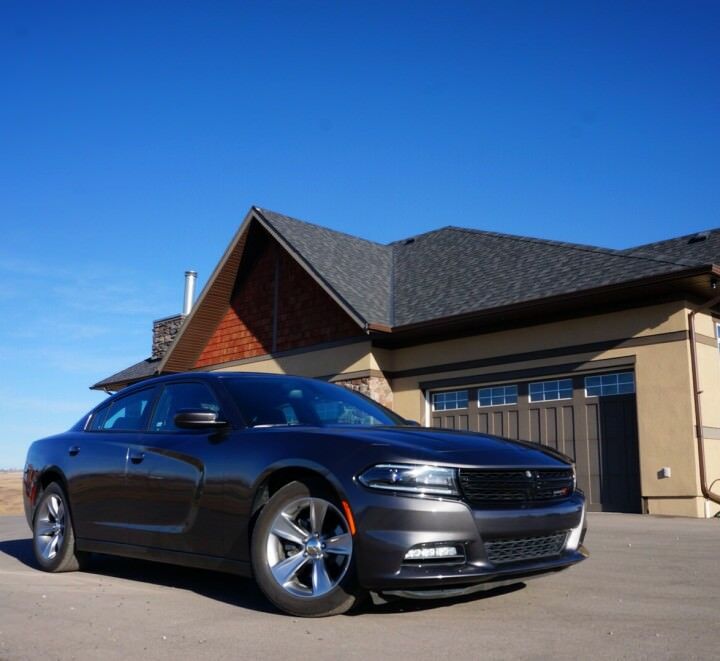 We would be driving around in our stylish 2015 Dodge Charger while in Canada…not bad, eh?! We stayed at my brother’s house in the countryside and had a total of 9 family members (14 if you include my brother & his family) come and visit us, all within the short duration of 10 days! It was a hectic visit (as always) but it was great to see everyone. We drank way too much wine, ate way too much food, did some shopping, played mini-golf & boardgames, and didn’t have nearly enough time with our loved ones. From front left and around table: Nick’s Mom, Dariece, Nick’s Grandpa, Grandma, Niece, Sister-in-law, Brother, Sister’s boyfriend, Nick. Aside from family, one of the things that we miss most from Canada while travelling is the food! We cooked up racks of ribs, bean and beef chilli, homemade soup, roasted chicken and fabulous burritos. Note: For those visiting Canada who are not Canadian citizens, whether on a stop-over or for a longer stay, you may need to apply for a Electronic Travel Authorization (ETA). Visa-exempt foreign nationals who fly to or transit through a Canadian airport need an Electronic Travel Authorization. However, those entering Canada by land or sea do not require an ETA. Furthermore, a number of visa-exempt foreign nationals do not require an ETA, such as U.S. citizens and travellers with a valid Canadian visa. Canadian citizens, including dual citizens and permanent resident, cannot apply for an ETA. I had my mom cook a giant ham meal and the ham stuffed breakfasts that follow. We also ordered in from our favourite pizza place in the world, Coco Brooks (only in Calgary), went out for Japanese food, and ate out at Subway 3 times. Oh ya, we definitely crave our favourite foods when on the road! By the end of the 10 days, we were exhausted, but we completed most of the errands that we had planned to do. Unfortunately, we didn’t spend much time on our website and online business, so now we’re rushing to play catch up. Hopefully we’ll have another episode of GoatLife TV for you guys to watch next week… from Barbados! On our final Sunday night in Canada, we hopped on a 3.5 hour flight to Toronto at midnight where we had a 3.5 hour layover before continuing on to Barbados. Arriving on the island was a breath of fresh air (literally). It felt so good to be back in tropical weather and our skin was instantly moist. Really don’t miss this very much! While we were lucky with lots of sunshine and above-freezing weather in Canada (aside from the one day, depressing photo above), our skin, hair and lips, just can’t handle the dry, cool weather of the north. Landing back in the Caribbean felt like an instant spa treatment and it feels so much better being in the heat and humidity. 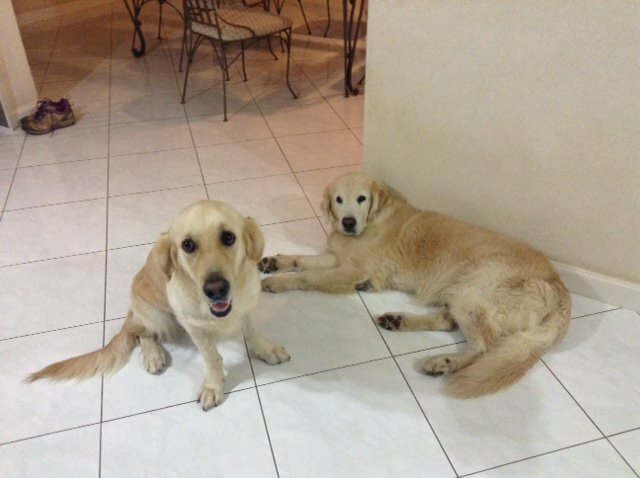 We are house sitting here for 6 weeks and the lovely owner, Jenny, picked us up from the airport and drove us back to her beautiful home (about 10 minutes from the sea for those of you who are wondering) to meet her 2 adorable golden retrievers, Hesus and Honey. She was kind enough to leave us with her car while she’s away, so we’ll be exploring the island and taking you guys (and Hesus & Honey) with us. We’ll also fill you in on house sitting and much more about how you can land a job like this one for a 6 week getaway in Barbados! 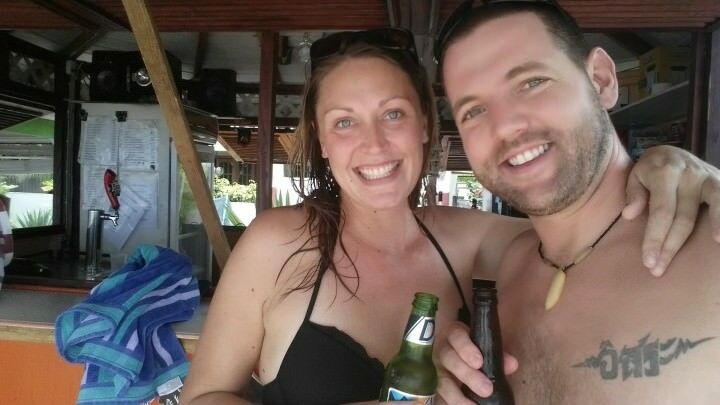 A couple of days after landing back in the tropics, it was my 31st birthday! We headed out to the beach for some sunshine, beers and swimming. We went to Payne’s Bay Beach and there was a funky and affordable little beach bar right on the water where we sat and enjoyed tasty fish sandwiches and french fries while watching the waves gently lap on the Barbadian coastline. 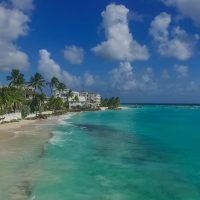 We can already tell that we’re going to love it here and there will be plenty of blogs, guides, photos and videos from here in beautiful Barbados, so definitely stay tuned guys! Have you ever been to Barbados? Give us your tips below! Special thanks to Coco Brooks, Subway Canada and Economy Bookings for helping to make our trip to Canada extra special. As always, all thoughts, opinions and views remain solely our own and are never altered by services, products or payments offered. I haven’t gotten an upgrade in the longest time but it’s always the best feeling. Can’t wait to see all your adventures in Barbados! BARBADOS – well jel. Good luck with the planing. We also now back home for Xmas with family before heading to Latin America in the new year. Great to be home but the coooold! Oh man that much snow already at this time?! I bet you’re glad to be hopping on a plane to Barbados! what a wonderful place to go house sitting! And you get to borrow the dogs too!!! Haha, that’s true 😉 I really think we went for the perfect amount of time. I really am fascinated by the idea of house sitting, but it’s just not the right time for us yet because of our own pets. Enjoy your time in Barbados, although I must admit I was excited by that snowy photo up above! It’s the skier in me. I can’t help it! Hahah–you’re crazy! 😀 We’re loving every second of being here in Barbados. Sounds like you had a great time back with your family. I agree trips home can be crazy but always worth it. We had a blast. Totally worth the little bit of craziness! Ah I’d love to nip home to see the family dog! Not so much the family (ha ha!) It’s getting chillier on the Westside but I don’t think I could handle what you guys go through at Winter. Contrary to belief, we don’t get much snow in the majority of Scotland so Vancouver is ideal for us! Bummer that you had snow though, we haven’t had much more than a light flurry on the east coast so far this year! Every time I go home, I feel the same. Running from house to house to visit family and eat all the FOOD! And let’s not forget my 3 cats. Yes!! The FOOD! Hahaha! 😀 Going home is always so hectic for us, but truly wonderful all the same. That’s crazy!! I must say, I’m a bit jealous you’ve only seen it once…snow can be beautiful, but it always means cold weather! From the tropics to the snow back to the tropics! Home always will be home though These two puppies look sweet! Exactly–no matter where we are in the world, home is always home 🙂 And the pups really are such sweethearts! It’s great that you were able to see so much of your family while you were home. It’s always so hard to get around to see everyone. I’m excited to hear about your time in Barbados. That sounds fantastic! Happy birthday! And wow, nice car upgrade there on the rental! I find it’s always fun revisiting home, and catching up with everyone and satisfying that craving for what was once local food!! You’ll have a fabulous time in Barbados though – looking forward to future updates! Always a great idea to get together with family. Honey and Hesus are indeed very very cute! And yeah, belated happy birthday! Thanks for the birthday wishes!! 😀 Our time spent with loved-ones was wonderful…so happy to be cuddling these sweet pups under the warm sun, though! Happy 31st to you! Sounds like you had an incredible birthday. My 30th is coming up and I hope to spend it as fabulously as you did! I like all the food you caught up on! It all sounds marvelous! We sure liked it too 😉 hahah! 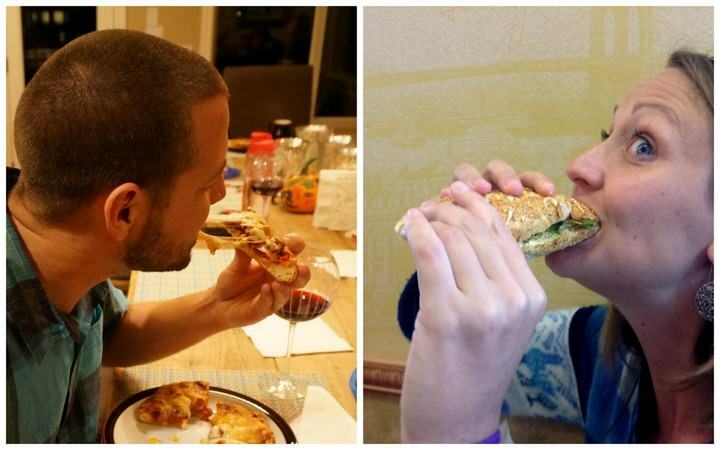 Everything was SO tasty–from home-cooked meals to subway we enjoyed it all!! I love the snow! What a great trip home – looks like you were surrounded by love. You guys rock. Keep up the amazing job with this site. Hi I’m happy for you guys, one more warm Christmas in sunny Barbados, enjoy life the best way you know how because life is short before you know it it’s all over. You hear me enjoy and say well. We have just been in Canada and thoroughly enjoyed the two cities we were able to visit, Montreal and Quebec. Haven’t been to Barbados but am certainly up for it. Happy Birthday and enjoy the house sit. Aw we’re glad you enjoyed what you saw of our home country! Barbados is quite beautiful too–we totally recommend that you visit one day! I feel the same way about my skin and hair every time I return to Nova Scotia in the winter. I love visiting my family and I love seeing the snow… from a distance. I hate shoveling and the cold. It is always nice to visit family however short the visit is, put documents in order, and plan for the next phase of your travels!!! We’ve been doing it for 6 years now! Enjoy! Six years…that’s awesome!! 😀 Good luck on your (hopefully many) future travels! We’re excited for you to read about this adventure so far, too. It’s been amazing. We seriously did do so much, it was crazy–but amazing. 😉 Glad to hear the information on housesitting was useful to you! Happy Birthday! Barbados would be a wonderful place to celebrate. 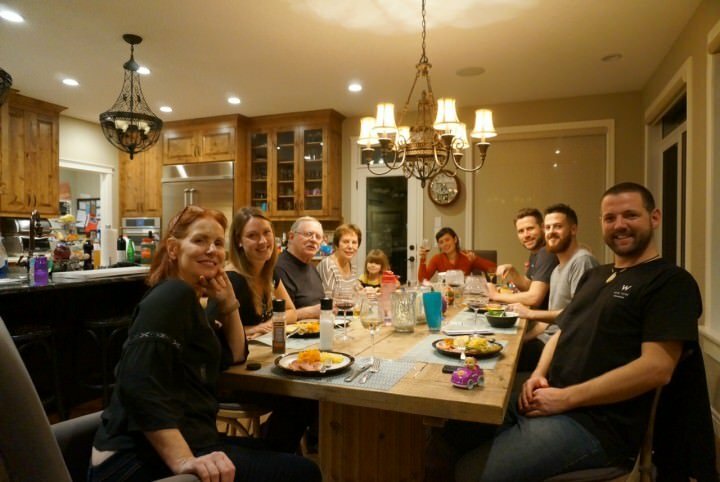 It is always nice to have the opportunity to connect with family and eat local food – there is no place like home! Enjoy Barbados – Hesus and Honey look so cute. It was the perfect place to spend my birthday 😀 We’re loving Barbados so far–and these pups are seriously awesome, haha! Living in Germany, of course we miss our family, but we are the same way about food when we go home…I always have a LOOONG list of things I MUST get (REAL Mexican food, STEAK and all my favorite local mom and pop shops just to name a few!!) I always gain 10 pounds just from a return visit home! Good to see that you made time to spend with the family. I imagine it helps to keep the balance and prevent travel burnout that is increasingly common among bloggers. There’s nothing like home cooking when you’ve been traveling for awhile. I’m glad you got to enjoy being with your family. The more we travel, the more we appreciate our loved ones. Aww, this looks like such a nice trip. Love the doggies! Aren’t they just the cutest?! We love them! It’s always great to spend time with family after being away for so long. Even though it can be a little crazy to try and spend time with them all. Enjoy your next adventure in Barbados and happy belated birthday! It sure is!! Catching up after so long was great. 🙂 Thanks so much, Vicky! I love Subway. There is one right around the corner from my place! Ah, that sounds like a pretty amazing way to travel, too! That looks like a wonderful family! I love getting together with my big family and sitting around telling funny stories about each other. I’ve never had a bad time with my loved ones. Ok, that’s not entirely true, haha! It seems like you picked a great time for a visit and you had a fun celebration! Family and food are the things we are all about on trips home too! Looks like you had a great visit, and I’m sure everyone was so happy to spend time with you. Can’t wait to read more about your adventures in Barbados! We truly did enjoy our time there! Seeing all of our family again felt amazing. Can’t wait for you to hear about what we’ve been doing in Barbados so far! I’m leaving Canada in Jan for the Caribbean, this post helps get me more pumped up (plus the fact that it snowed here yesterday). a look at your website in Safari, it loks fine but when opening in IE, it’s got some overlapping issues. Ok, thank you. we’ll look into it. I have two kids going to university, (the same one) and I’ll give this to them so they can eat! It’s scary to say I haven’t been home in 7 years. My family have visited me here in Canada but flying to NZ is too expensive for me. I’d like the subway card so I can eat well and save some cash. Sometimes the biggest challenges of living away is not being able to see family as often as you would like. Hopefully you guys will find a way to see each other again soon! There are a lot of Subway locations when we are doing our day trip so it will be perfect! Awesome 😀 Have fun on your day trip! Love love love your blog guys. 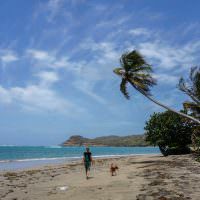 We are in Costa Rica right now and heading to Nicaragua in the morning to do our first house sit! 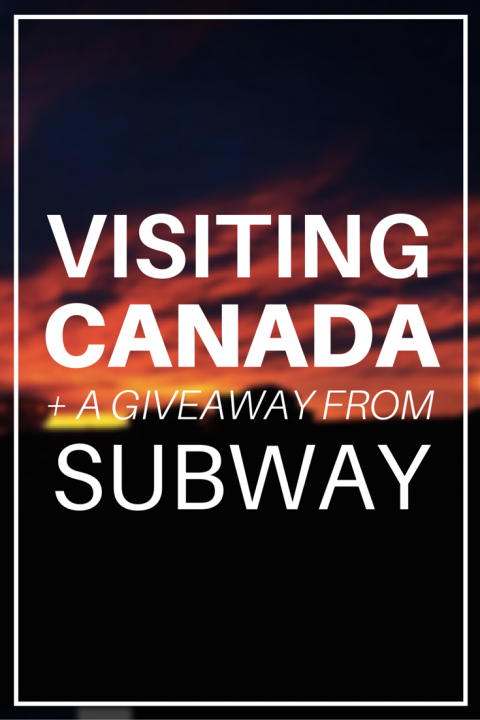 But we are from Canada and will be returning in the spring, so a Subway gift card would be awesome. Can’t wait to hear more about Barbados! Thanks so much, Nancy! Sounds like a wonderful adventure–good luck with your first house sit! Hey Goats! Heard about you over the past few months, but just recently started watching your YouTube videos. Great cinematography, BTW! By far some of the best travel videos I have ever seen. I didn’t realize you two are fellow Canadians! Me, too. I am based in Toronto. What part of Canada are you two from? Thanks for stopping by! We really appreciate the kind words about our YouTube videos, thanks so much 🙂 We’re from Vernon in the Okanagan, B.C., but we lived in Calgary for around 6 years as well. Never been to TO! Is this the last time you have been back? Wow… Life on the road! Canada is so fascinating! There are many breathtaking spots to explore and it’s definitely worth to visit every province as there are very diversified. Thanks for sharing!